The Chinese have been using paper to write on for over two millenia. According to fairly recent archeological finds, paper were being made in China as early has the 1st century BC. The oldest surviving record of paper making in China is a report to the Eastern Han Emperor Ho-di, dated to 105 A.D. Early chinese paper was made from the bark of the mulberry tree. The bark fibers were broken and pounded into a sheet. Later, the Chinese discovered that one could make higher quality paper by adding hemp rags and old fish nets to the pulp. The history of Chinese writing is older than that of Chinese paper. Before the use of paper became widespread in the country, writers would write on bamboo or on pieces of silk. Silk was leight weight and convenient, but extremely expensive. Bamboo was cheap and readily available, but heavy and cumbersome to store and transport. Paper on the other hand was both cheaper than silk and more practical than bamboo. 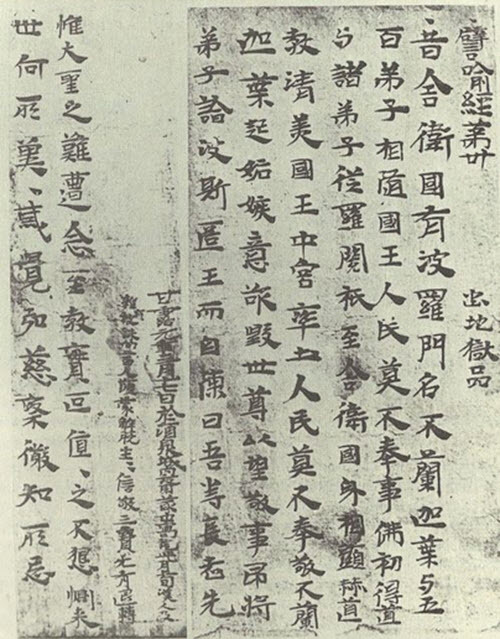 Combined with woodblock printing (invented around 600 AD), comparatively inexpensive paper made it possible to launch China’s first printed newspaper in 740 AD. One of the many things that spread along the Silk Road was the custom of making paper from natural fibers. We do for instance know that paper was introduced to Xinjiang in northwestern China very early through travellers on the Silk Road. Examples of places along the Silk Road were paper was present as early as the 2nd century AD are Loulan, Kotan, Kusha, and Dunhuang. China tried to keep the art of paper making a secret to prevent other countries from setting up their own paper production, but it was only partly effective. Paper making reached Tibet and India in the mid-600s AD and local paper making centers were formed. Reports by the Chinese Buddhist monk Xuanzang dated to 671 AD show that at in the 670s, paper was already in widespread use in the parts of India that he visited. The earliest known instances of paper making in Korea is from the 6th century. In Korea, early paper was made from a pulp consistig of fibers from hemp, mulberry, rattan, bamboo, rice straw, and seaweed. According to tradition, paper making was introduced to Japan by a Korean buddhist monk named Don-cho, who taught paper making at the Imperial Palace aroudn the year 610 AD. At this point, buddhism was still a faily new religion in Japan, having been first introduced some 60 years earlier. In 751 AD, Ottoman Turks defeated the Chinese T’ang army at the Battle of the Talas River. Among the Chinese taken as prisoners of war were some that new how to make paper. When brought to Samarkand, they showed their Arab capturers the secrets of paper production, and by 790s AD, Samarkand was home to a flurishing paper industry. Just like the Chinese, the Arabs of Samarkand strived to keep the know-how of paper making a secret, but the practise did spread to Egypt during the early 900s. Of course, Egypt already had its own very long tradition of writing on something that was quite similar to paper – papyrus. Papyrus is made from the pith of the papyrus plant, a wetland sedge that is native to the Nile region. The earliest archeological evidence of papyrus are remains dated from circa 2555 BC, found during excavatons of the ancient harbor at Wadi al-Jarf on the Red Sea coast. By 1150 AD, paper were present in Spain, having been brought there as a result of the crusades. Soon, the first European paper industry had been established in Spain.